Natalia Sander was born near St. Petersburg in Russia. She began playing the piano at the age of 7 and appeared publically already two years later. In 1986 she graduated "with distinction" from the Special Music School of the State Conservatory St. Petersburg, where she studied piano, organ, and conducting. From 1986 to 1991 she studied piano and organ in the concert class of Prof. Galina I. Kozlova at the Nizhni Novgorod State Conservatory, where she obtained the Diploma of Concert Artist, Music Teacher, and Chamber Musician. Further studies with Prof. Ulrich Bremsteller at the Hochschule für Musik und Theater Hannover and with Hans-Ola Ericsson at the Musikhögskolan Piteå (Sweden), as well as masterclasses with Leo Krämer, Martin Haselböck, Luigi Ferdinando Tagliavini, Daniel Roth, Olivier Latry, Karlheinz Kämmerling, Lev Naumov, Lev Natochenny, and Arbo Valdma completed her broad musical education. 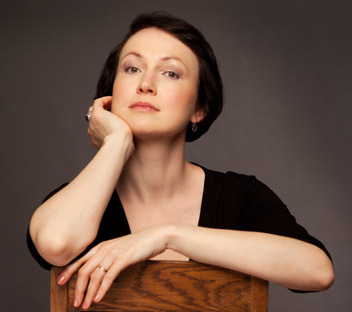 In 2006, she passed her doctoral examinations (VAK Moscow) with a dissertation about the organ works of Max Reger. Several publications about Max Reger and his circle appeared in Russian musicological journals. Natalia Sander gives recitals as an organist and as a pianist in Russia, Germany, France, The Netherlands, Sweden, Switzerland, and Austria (at, among others, Kreuzkirche and Frauenkirche Dresden, Marktkirche Hannover, St. Jacobi Göttingen, Cathedrals at Fulda, Limburg, Erfurt, Altenberg, and Paderborn, Kaiser-Wilhelm-Gedächtnis-Kirche Berlin, Münster Überlingen, St. Jakobi Lübeck, Münster Ulm, Pauluskirche and Münster Basel, Lulea Cathedral, Luxembourg Cathedral, Augustinerkirche Wien, Saint-Sulpice Paris). She performed as a soloist with orchestra in Germany and Russia. Together with her sister, Anna Tchinaeva, she won the Chamber Music Competition of the U.F.A.M. in Paris. Her repertoire comprises all major styles from the baroque period to modern composers. It also includes nearly the complete works by Olivier Messiaen (the cycles: L'Ascension, La Nativité du Seigneur, Les Corps Glorieux, Messe de la Pentecôte, Méditations sur le Mystère de la Sainte Trinité, Livre du Saint-Sacrement as well as the earlier pieces). In addition to her solo recitals, she regularly performs in chamber music with piano and in projects "Organ plus" together with other instruments like trumpet, clarinet, flute, and violin. As a specialty, her combined programmes for organ and piano include Messiaen, Schumann, and Bach recitals. For example, in commemoration of the 10th anniversary of Olivier Messiaen's death in 2002, Messiaen performances (selection from Vingt Regards sur l'Enfant-Jésus for piano, and from various of his organ works) took place in Germany and Austria. She is a guest organ teacher at the State Conservatory Nizhni Novgorod (the third-largest Conservatory in Russia) and conducted master-classes in Germany and Russia. From 2010 to 2012, she was organist at the historical organ, built by Stumm in 1781-85, at St Ulrich's church Neckargemünd. Starting Oct. 2012, she teaches piano at the Hochschule für Musik Detmold.